Troy and I decided recently we wanted to start making our own bread. While we both try to cut back on processed flour products as much as possible, our girls do not, and I have major guilt every time I buy the cheap non-organic bread. If the bread doesn't mold, it's probably got some toxic chemicals in it, or at least that's what I tell myself. Organic bread for a family of 6 can get pricey, it practically takes a whole loaf for us all to have a sandwich... surly making our own bread will be better for all of us, and more cost effective... surly. I made my second loaf this morning, and it turned out AMAZING! 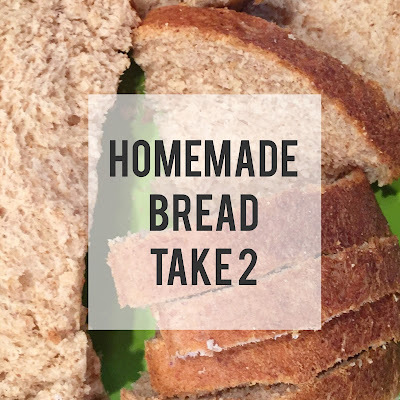 I plan on sharing my bread making adventures via my blog, so that A- I have the recipes saved, and B- you can try them too! I have the bread machine that my parents used when I was young, it's great quality, I'm not sure they make them like they used to (from what I've read). This recipe is SO SIMPLE, I plan on making some tweaks to make it healthier, but I used what I had on hand to get started. If you have a bread machine, I highly suggest you try this recipe. It only takes about 5 minutes to prep, then the machine does all the work! This was my 2nd attempt at making homemade wheat bread in my bread machine. It is soft, with a nice crust, and my family LOVES it. It's also super simple and you probably have the ingredients in your pantry already. Add hot water, yeast, and sugar to your bread machine, let sit until it gets foamy, 6-12 minutes. Add the oil, salt, and flour. Turn the machine on to the white bread function and start. Cheers to eating real food!